I believe in health care that is based on a personal commitment to meet patient needs with compassion and care. My favorite part of being a doctor is the opportunity to directly improve the health and well being of my patients and to develop professional and personal relationships with them. I pride myself in attending local and statewide seminars to stay current with the latest techniques, and treatment planning. Dr. Prashant Parate is a renowned Orthopedist in Azamshah Layout, Nagpur. He has been a practicing Orthopedist for 11 years. 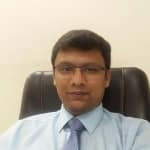 He has done Fellowship in Shoulder and Knee Surgeries, DNB (Orthopedics), Diploma In Orthopaedics (D. Ortho), MBBS. He is currently practising at Ameyaa Orthopaedics And Sports Medicine Center in Azamshah Layout, Nagpur. Book an appointment online with Dr. Prashant Parate on Lybrate.com. Lybrate.com has top trusted Orthopedists from across India. You will find Orthopedists with more than 39 years of experience on Lybrate.com. You can find Orthopedists online in Nagpur and from across India. View the profile of medical specialists and their reviews from other patients to make an informed decision. I remember, I read an article of Dr Prashant Parate in the paper and made contact. No matter how critical be the situation, he is always very calm. I have consulted so many doctors but nobody till now was able to understand my concern properly, until i consulted Dr Prashant Parate. It was a bad case of elbow pain. The overall atmosphere in the Meditrina Institute of Medical Sciences is very soothing. It has all the latest technology in place to handle severe cases. Over the period of time the elbow pain treatment has helped me in recovery. And I am looking for further improvement as well. Never thought I will suffer from Knee pain like this. I must say the hygiene was maintained very nicely in the Meditrina Institute. I read about the Dr Parate on one of the social media platform. I am amazed that he is such a sweet doctor, even though he is so busy all the time. In the very first sitting, Dr Parate clearly told us the problem and the what the treatment procedure will be in future. I am really grateful as his knee pain treatment has give me a ray of hope. I have consulted so many doctors , but no one was able to give me knee care. He is a very practical doctor. I read about the Dr Prashant on one of the social media platform. he has so much knowledge that for everything my family takes his reference. I am so much benefitted with his treatment, that i am perfectly fine now. The overall outlook of the Meditrina Institute of Medical Sciences was very nice. I was suffering from acute knee pain and also I started observing swelling on my knees from some time. As someone referred, I consulted Dr Prashant. He is so pleasant to talk to and always ready to answer your doubts. Hei is well aware about innovative techniques to treat problems. I am so much benefitted with his swelling treatment, that i am perfectly fine now. His treatment suited me the best. I wa suffering from shoulder pain for which I consulted Dr Prashant. My problem was such that it required a number of sessions, and I must say after all the sessions, I am feeling much better now. Almost all doctors suggested surgery for it, but I did not wanted to go for it for my shoulder pain. But thanks to Dr Prashant for the perfect advice. I was in so much pain due to my scoliosis. I consulted Dr Prashant who has a broad knowledge in the field of orthopaedics. I was quite impressed with his concept of holistic healing. Finally with his treatment, I am completely cured from the disease. The atmosphere in the Meditrina Institute is always so positive and full of life. I have consulted dr Prashant Parate at his clinic Maayra Shoulder and Knee Care Center which is located at Nagpur as I was suffering from knee joint pain right after my accident with an auto Accident Injuries Treatment , He helped me a lot in reducing that pain and increasing calcium density in my bones which feels better now. I was having this muscle disorder, but the symptoms were not very visible. Dr Prashant is one of the best physicians in city. Even after my treatment with my old doctor, I never felt so much relief, but he has treated my completely. The friendliness of staff is the best in the Meditrina Medical Sciences. dr Prashant Paratedid myarthroscopy I am very happy with his course. Effective medicines. Guidance too is good. I visited him at Meditrina Institute of Medical Sciences in nagpur. Hi, Two day before I was playing cricket, while running in my right leg's knee joint I suddenly felt muscular cramp and I fall down on ground, it was just like there was no sense in my right leg. It's not paining but I can not run or work like that with my leg. Again and again it's happening in same manner. Please suggest me treatment. Your complaints are suggestive of ligament injury. It may be ACL tear. You need clinical evaluation and MRI of your knee to confirm diagnosis. Treatment will depend upon exact diagnosis. My mother is having knee Pains in Both legs she cannot walk properly & if she walk for some distance she will get tired. She is taking some homeopathy medicine called, Dr. G that is so costly she, even though is not getting of the pain. Pl. Tell what to do. Her knee caps are getting Rubbed along time a Dr. Told that. Is it right pl. Tell. Dear friend, It seems your mother is having Arthritis of knee joint which is common in this age. I would like to see x Rays of her knee before advising any treatment. Treatment depends upon stage of disease and varies from just medicine for couple of days along with physiotherapy or total knee replacement. It will depend upon stage of disease and expectations of your mother. Disabling Pain In Shoulder - It Could Be Shoulder Impingement!! Surgery may also be option of treatment when non-operative treatment fails or pain worsens during non-operative treatment. Surgery is performed to trim part of Acromio bone which is causing impingement on underlying Rotator cuff to provide adequate space for mobility of tendons. If you wish to discuss about any specific problem, you can consult an Orthopedist. A shoulder dislocation occurs when the bones of the upper arm snap out of your shoulder blade, generally after suffering a major injury. The joints of the shoulder are the most flexible body joints, thereby, making them more prone to dislocation. In most of the cases, a dislocated shoulder can be fixed within a few weeks’ time with the help of proper diagnosis. There is a high chance of suffering from dislocations over and over again. A dislocated shoulder, if not treated immediately, can lead to further complications such as damage to the blood vessels and nerve around the affected area or tearing of the associated muscles or ligaments. What can cause a shoulder dislocation? Shoulder dislocation can occur if you play any kind of contact sports such as football or hockey and get injured while playing. You are more susceptible to a dislocated shoulder if the sports or physical activities you engage in regularly involve the risk of suffering from falls such as gymnastics or volleyball. A dislocated shoulder is a common occurrence if you have suffered a major motor vehicle accident that might have affected your shoulder. You can also suffer from a dislocated shoulder if you have survived a fall in the recent past such as tripping from a ladder or similar injuries. Depending upon the intensity of the pain, the doctor might implement a general manoeuvre procedure to relocate your shoulder bones. After the procedure is conducted, you will feel your pain significantly reducing. Your doctor can also recommend you to wear a sling around your shoulder area to regulate the movement of the shoulder joints for the first few days to about 3 weeks, depending upon the intensity of the pain. If its first episode of shoulder dislocation, usually closed reduction followed by rehabilitation is sufficient. In case when patient is younger than 20 years or in cases with bony injury, surgery is recommended. If you had recurrent instances of dislocated shoulders, your doctor might suggest a surgery. Recurrent dislocations cause more and more damage to glenoid part of scapula and humeral head. Type of surgery required changes from simple surgery to more difficult surgery with number of dislocations. In cases of simple capsulo-labral damage, capsulolabral repair is sufficient. In cases with loss of bone from humeral head (Hillsachs Lesion), Remplissage surgery is required additionally. When glenoid bone also is deficient of bone, bony reconstruction of glenoid becomes necessary. If you wish to discuss about any specific problem, you can consult an Orthopedist. Shoulder Pain - Know The Reasons Behind It!! The shoulder is one of the most important joints in the body that uses a ball and socket to join the arm to the rest of the body. Any pain can make it difficult to carry out motion in a comfortable manner. The shoulder consists of the long arm bone called the humerus, the collar bone or the clavicle, as well as the shoulder blade called the scapula. A layer of cartilage provides essential padding to the bones in this area and its two main joints. There are a number of issues that can cause shoulder pain. Let us get to know the six most common ones. Bursitis: This condition is known to affect the fluid filled sacs that lie in between the joints. These are known as bursae. When the bursae suffers from swelling, the effect usually shows up as pain in the joints. Acute and persistent pain that does not abate and gets even worse should be treated with immediate medical intervention. If you wish to discuss about any specific problem, you can consult an orthopedist. Hi doctors, We are a group of friends plays cricket on weekend only to keep ourself fit. After playing max of us complaining pain in legs under knees only. Some of us started to have a dose of calcirol sachet weekly. It helps a bit. Age of members are about 36 to 40. Pls suggest. Dear friend, it's good that you want to do something for fitness, but alas, This is very wrong approach towards fitness. You have to be fit to play any game. You can't become fit by playing game. It increases chances of injury. We call people like you - weekend warriors. You have highest chances of sports injuries. Instead of weekend bonanza, you should spare some time regularly. Even 20 minutes daily or alternate day will be sufficient! Can Poor Diet and Nutrition be a Cause of Arthritis? Osteoarthritis: This is characterized by a breakdown of the cartilage between the bones. It is mostly known to affect a person’s joints. Rheumatoid Arthritis: This is a form of auto immune disease that severely affects the lining within the joints of bones. Diet and nutrition habits: Some food items, especially red meat and products derived from animals can cause a rise in the level of uric acid thus, increasing the risks of arthritis as well as gout. Smoking also has been known to worsen this condition. Genetic predisposition: Some people are more prone to develop arthritis as they are genetically predisposed to it. Problem in the immune system: Rheumatoid arthritis is one condition which is caused by the attack of immune system on the lining of the joints within the body. Obesity: The joints are subject to excess stress because of the excess weight. This results in a higher risk of arthritis in obese people. Age: The risk of arthritis increases with age. Family history: It is possible for you to be vulnerable to this disorder if arthritis runs in the family. Previous injury: People who have had a previous joint injury are more susceptible to arthritis. Hello sir/madam I am in trouble I need your help. Few days ago I played cricket after a long while and after running and becoming exhausted I did overarm bowling with season ball 10 - 12 times repeatedly with a 1 minute of gap after each time I bowled and after the 5th time I started feeling uneasiness in my shoulder and after the ninth ball my shoulder started paining badly till one hour and after that it was paining only when I was trying to lift my arm in front of me or when I was pressing the shoulder and chest area. Now 4 days have passed and the paining sensation has stopped by 80 to 90% but still I am feeling discomfort when I am having a cup of tea or raising my arm above shoulder level. Can you please give me some suggestion to me for healing it properly? Dear I would advice you to take rest for 2 weeks. Do not do activities which cause pain. Apply ice 5 to 6 times daily, 10 minutes each time. If you don't feel better in 2 weeks, clinical examination will be required. I am 25 years old male, while dancing at a party last night I suddenly got a knee jerk in my right leg and fell down, since then I am not able to straighten my leg. I am also not able to walk as it gives me lot of pain, I cannot see aby swelling though but for any movement I get high pain ,the pain is internal and not on some specific point on my knee. Please tell me what should I do and how long it will take me to get absolutely normal so that I can run again. Dear lybrate-user I hope your knee has gets better soon. It may be ligament or meniscus injury which is seen in such kind of trauma. Apply ice daily for 5 to 6 times, 10 minutes every time. Take rest for couple of days. Do not walk on painful leg. If you don't get relief by ice application, x ray and MRI of knee may be required after clinical examination depending on findings.